Aging cannot be avoided. If these words make you think and add thoughts of your own, you are not alone. Mature horse owners and riders are growing in numbers as we strive to stay vital in these, our years of “gold”. You might be surprised, however, to know that the Musings of Gold were actually recorded after I spent some time looking into the eyes of Saint, our 22 year old thoroughbred. He speaks to me with his eyes and his soft horse ways. His warm, slobbering kisses and his sighs when you scratch his rump say more to me than any speech. The musings are the thoughts I believe Saint would record if he were trying to tell me about his life on our farm. These are the simple truths that he would want to share with me in his “golden years”. They are words I believe are from his heart as well as mine. Yet like so many who find themselves being classified as “old”, we mature riders and our trusty seasoned mounts find that not many will give us a second look. I learned this when my husband encouraged me to ride again, though it had been years – and to be candid, not just a few. I must say, at 55, just getting on the horse from the ground is under- appreciated. Posting a trot is a sport in itself. Being unloaded is the equivalent of an earthquake. A request for lessons at this age is met with smirks and winks. Putting on leggings or riding pants is a revelation for sure – and not in a good way. And being included in a trail ride is a gesture from the younger teams. If we oldies persevere and decide to buy a horse to call our own, we are told to look for the dull or the large. They aren’t as likely to kill us. But I chose to look for an “experienced horse” to take me on my riding adventures. I figured if he knew his job, I could be forgiven a few mistakes. I have never looked back. It was the perfect decision at the perfect time. Some will say that older horses have “baggage”. Like older riders don’t! Some will say that older horses are not as sound as younger ones. No kidding – but then neither am I. Some will say that older horses can’t tolerate strenuous activity. Well, after my first ride, my seat bones sure recognized that I needed to work on stamina. And some will say that older horses will break your heart when they can only be pasture mates and not mounts. I expect that Saint and I will reach that plateau about the same time. Saint and I have our good days and our “not so good”. But we are not fair-weather friends. We understand that keeping schedules or riding on a particular day at a particular time is not nearly as important as spending time keeping each other company. If one of us isn’t feeling up to the trails, a good brushing or a snooze in the sun will fill the bill and leave us both satisfied. When we do ride, we can carry our own. We may not canter at every opportunity, but we handle obstacles and challenges better than many of the youngsters. Not nearly as spooky or surprised by things, we focus on the trust that we have in each other rather than the object that looms in the path. Maturity and experience bring focus and communication at levels that babies can’t know. The discerning instincts of the experienced horse and the older rider find ways to make the link when others can’t. I call this “gold on gold”- it’s a gentle way of saying old riders on old horses. In the big picture, a gold on gold relationship is the flicker of a flame; the blink of an eye; a flash in the pan. It will last but a while, but the connection between a mature rider and an experienced horse is a soulful, profound albeit brief partnership. It can only happen when all the conditions are right. Without diminishing the partnerships of younger riders and horses, these gold on gold moments are deeper, more profound, and reverent. It is a glimpse of heaven – a peak that only the more mature can capture. My purpose is to sing the praises of the horse – as he ages. The smell of the barn in the morning is the same, no matter what the age of the horse. The sweet feed still leaves its molasses traces on your fingers. The nuzzles are just as warm if not more so. The supplements are for joints and organs rather than performance and shine. A good currycomb is still appreciated and there is an “understanding” when it comes to just how much lunging is necessary before a ride. 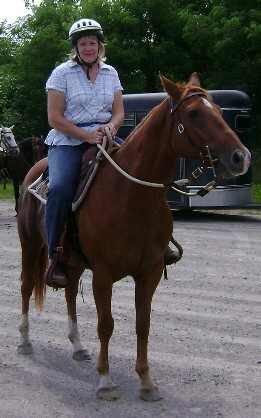 Tracey and her other trusty, experienced horse, 20 year old Denver, return from a lovely trail ride. The older horse also has thoughts to add. We might need a block to make the mounting more tolerable but the gentle placement of a knowledgeable seat floods the mind with memories of great rides. We may not ride for hours on end and we don’t have the same need for speed that we had in our younger years but we can still show the youngsters how to handle the woods and water. Extremely hot days or unbearable cold are off limits – and nobody has to spell it out. Evening rides with paths lit only by fireflies are not as exciting as endurance trail riding – but they are sweet and peaceful and quietly loving. For both of us, the singular most profound delight of a good ride in the woods, of that first fleeting moment in the barn at daybreak, and the “good night “ at stall side each sunset – well, they are unparalleled. It doesn’t make any difference whatsoever that my crown and his muzzle are gray. We keep each other young and we will fly like the wind together, even if only in the dreams we share on a lazy afternoon. If you are a mature rider and would like help enjoying your horse, you might like an Apprenticeship.